Variety is the watchword for our Twentieth Collection of Random Rarities. 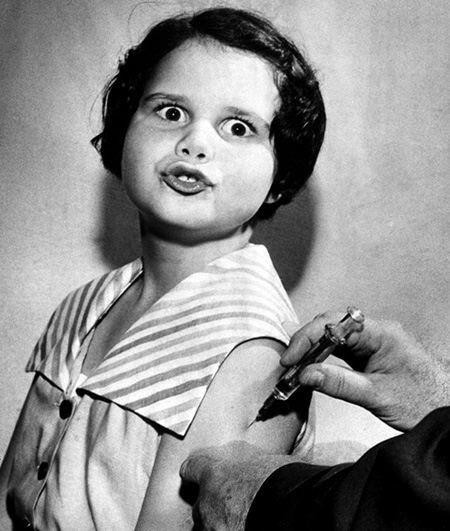 The Forty Million came to us from NBC in 1952 presenting information concerning the health and well-being of America's 40 million children. Gleason and Armstrong were a couple of palookas from "New Joisey" determined to make it into the big time and hopefully pick up a few buck and maybe a pretty girl or two along the way. Originally syndicated by Hollywood Features in 1931, our heroes' show has many elements of an early soap opera, but the dish-suds and the floor-polish crowd was hardly this show's target audience. Isn't It a Crime? is a closed-door mystery involving a mystery writer and his girlfriend entitled "Speaking of Murder". The creepiness factor is laid on thick and heavy as all the clues are presented for the listener and the announcer promises that we will get a chance to solve the case before the characters find out whodunit. June is My Girl, "and fellas, what girl!" This is an audition program for a situation comedy starring screen princess Diana Lynn. The situation is a pretty young girl working for an employment agency which is failing. Although the show did not make it past the audition stage, it featured some Radio Row powerhouse talent. Along with Miss Lynn, there was Harry Bartell, Parley Baer (doubling), and Alan Reed. The Junior Grand Ol' Opry is proof that country music will never be "old fashioned". Sponsored by Goo Goo Clusters Candy, the Junior Version of the Opry was a talent contest for up and coming young country talent. Listeners were encouraged to vote for their favorites by writing the name of their favorites on a Goo Goo wrapper and mailing it to Nashville. WWII was unique in American experience because it was the first time that so much of the action was brought into American homes live via radio. KGU Radio in Honolulu was able to report to the Nation as the Pearl Harbor Attack was occurring. This is a historically significant broadcast, allowing us to hear the world changing before our ears. Laff Parade was lively audio circus transcribed by Transco in 1934. Hosted by Ken Niles, the show featured the girl harmonies of The Rhythmettes and the clowning of The Radio Rogues and The Two Black Jacks. The Lucky Strike Hour was an effort to raise awareness of fine tobacco a decade before the cigarette company began sponsoring Jack Benny. The earlier program combined dance band selections along with dramatic presentations, including stories from the files of the FBI. The Maytag Frolics from 1929 was one of the earliest efforts of radio advertising. The show was syndicated by the National Radio Advertising Incorporated. The show attempted to recreate different live music venues, in the episode included here a father takes his son to his first minstrel show. 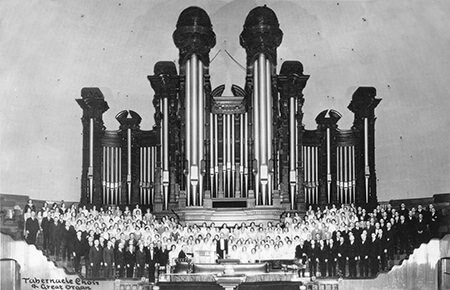 The Mormon Tabernacle Choir was formed in 1847, less than a month after the Mormon pioneers began settling in the Salt Lake Valley. During its early years, the Choir was a somewhat unruly group, but just as the great Tabernacle was under construction, the Choir began to find discipline under newly appointed director George Careless, a graduate of the Royal Academy in London. The Choir has been broadcasting Music and the Spoken Word every week since July 15, 1929, one of the longest continuous radio broadcasts. National Boy's Club Week is an annual fund driving event for the National Boy's Club (now known and the National Boys and Girls Clubs) movement. The BGCA is a national organization made up of local chapters whose mission is to provide after-school activities for youth. The first Boys Club was formed in Hartford Connecticut in 1860. For the syndicated radio program, some of Hollywood's greatest and most recognizable talent gave their time and voices to the cause. The New Swan Soap Show was an almost seamless continuation The Pepsodent Show Starring Bob Hope after the toothpaste pulled its ten-year sponsorship due to low ratings. Bob and Doris Day were the only continuation from the old show, the rest of Bob's regulars having moved on. Bob was determined to stick to radio, but the show was slotted against Life With Luigi, the season's breakout hit. Night Flight 76 was an overnight music program on WJR Detroit during the late 1970s. Host Jay Roberts set the program as a relaxing overnight jetliner flight, back before TSA and major airport hassles, when jet travel was still luxurious. The selections are recorded direct from air and include hourly news and sports reports. Once Upon a Tune was a late Forties effort by Columbia Broadcasting to create a "Radio Cartoon". The technical and artistic resources of the Tiffany Network came together to create a series of audio pictures nearly as vivid as those created for Norman Corwin's Columbia Workshop. 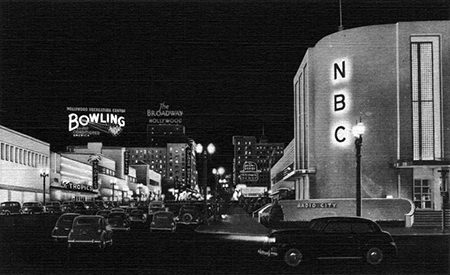 The Opening of the NBC Hollywood Studios marked an important shift not only in radio and the entertainment industry but in the whole of American culture. New York remained the center of finance and Broadway was largely considered the capital of American entertainment, but when nationwide programming over the major networks began originating from the West Coast, it symbolized the on-going shift in national interest to the Pacific and the Western States. Hollywood became the movie capital because of the weather, and radio (later television) grew due to the proximity to the film industry. I wanted to take a moment to let you know how much I appreciate your web site. You do a superb job providing historical information regarding these wonderful broadcasts. My particular area of interest is the popular music of the 1930's and 1940's (the "swing era"). I also like advertisements from this period. Thank you for making these great broadcasts available to all!